A pocket watch is the first known worn timepiece in history. This holiday season, you can share the elegance and beauty of the historical era by giving this luxurious Herrington engraved silver pocket watch as a gift for the men in your life. This classic monogram pocket watch will fit any fashion and style and will serve as a treasured keepsake with the custom engraving of a monogram and a special message. The silver pocket watch is quality constructed with finely engineered parts, featuring a brushed metal finish and a classic, easy to read white face. Using Quartz crystal as an alternative to tuning forks, this custom pocket watch is a reliable and impressive piece that will surely be cherished for generations. The pocket watch includes a characteristic hinged cover that can be closed to protect the watch from damage. 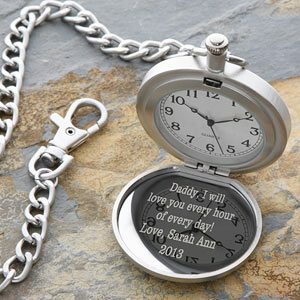 An ideal gift for a dad, grandfather, uncle, brother, husband or significant other, this silver pocket watch is skillfully engraved to your specifications with 2-3 initials on the front and a five-line message on the back. The custom engraved pocket watch comes in a beautiful black gift box with a fitted insert to ensure it’s protected. Stainless steel back, silver-plate with brushed metal finish and a detachable 14-inch chain. The watch measures 1 ¾-inches; the watch face measures 1 5/8-inches in diameter. Uses a reliable Quartz crystal movement that does not require winding. Add any monogram on the front and up to 5 lines of text on the back. The Herrington engraved silver pocket watch is a truly timeless Christmas gift made even more special through the custom monogram and message. I like the style of the Herrington Engraved Silver Pocket Watch. I just love pocket watches, and adding a inspirational or moving quote makes it amazing. I like the Signature Series Personalized Bag Tags. One of our most valuable possessions is time. Use is wisely and keep time with this lovely pocket watch. I would love to have this for mt 19 yr. Old son; he just moved out and i was really sad to see him go, but he informed me he just moving down the street not to another state.